The Tiffany Yellow Diamond gets it's name from Tiffany &Co. the household name in jewelry around the world, and the company that has owned this diamond ever since they purchased it at Paris in 1878 for $18,000. The purchase of this extraordinary diamond ,helped earn, Charles Lewis Tiffany the founder of the company, the nickname "King of Diamonds". The diamond is a 128.54-carat, cushion-shaped, stellar brilliant cut stone, having a golden yellow or canary yellow color. the clarity of the stone is not known. The diamond has never been graded by a reputed diamond testing and grading laboratory like the G.I.A. Hence the lack of precise color and clarity grades for the stone, in keeping with modern international grading scales. The dimensions of the diamond are said to be 28.25 x 27 x 22.2 mm. There are a total of 90 facets in the diamond, 48 on the pavilion, 40 on the crown, plus the table and culet facets. The diamond is a stellar-cut brilliant with a star like arrangement of small facets radiating from the culet. The crown is stepped but instead of the usual two steps, an additional step has been included, making it three. In all there are 90 facets in the diamond, compared with the usual 58 facets of the standard brilliant-cut. The unprecedented number of facets given to the stone according to Dr. George Frederick Kunz, Tiffany's eminent Gemologist, under whose supervision the cutting was executed, was to reduce the brilliancy of the stone, in order to give it the effect of a smothered smoldering fire, rather than one of flashing radiances. Perhaps another reason would have been to minimize the weight loss, in order to retain as much weight as possible, so as to keep the weight of the stone above the magic figure of 100 carats. 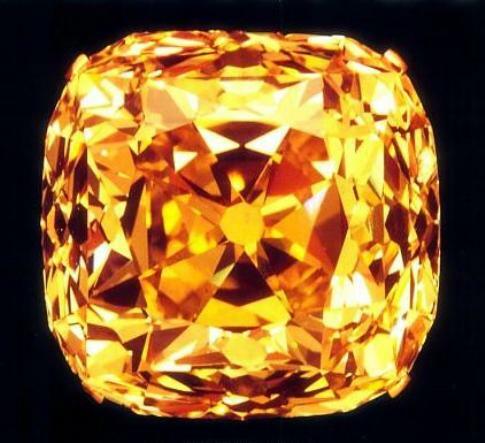 An examination of the Tiffany yellow's facet layout, shows that it has an exceptionally high crown, and a deep pavilion, also indicating that the diamond has been cut to maximize the carat weight. The deep cut pavilion invariably results in the loss of some internally reflected light, through the pavilion or the girdle, thus reducing it's brilliance. In an ideally cut diamond all rays of light that enter through the table-facet are totally and internally reflected twice at the pavilion facets making an angle of 90˚at each turn and are reflected back out of the diamond again through the table facet, to the observer's eye, giving a fiery brilliant effect. Tiffany &Co. started their business activities in 1837, with the opening of a stationery and fancy goods store in New York, co-founded by Charles Lewis Tiffany and John B Young. As the business expanded they offered jewelry and silverware as well. In 1841 the company was called Tiffany, Young, and Ellis. In 1848 the company also started to manufacture jewelry and in 1850 further expanded their business by opening a branch in Paris. In 1851 by adopting the standards of English silver, Tiffany introduced the term "sterling"to the United States . In 1853, he purchased the shares of his co-founders and became the sole owner of the company, thereby changing it's name to Tiffany &Co. When the American civil war broke out in 1861, he used most of his capital for the manufacture of swords, medals and other war materials. In 1868 Tiffany &Co. was incorporated and branches were established in London and Geneva. In 1887 at the sale of the French crown jewels, he purchased 24 out of the total 69 lots, ie. almost one-third of the items put up for sale, which included a famous diamond necklace belonging to Empress Eugenie, the finest single item to go on sale. After the discovery of diamonds in South Africa in 1867, Tiffany sent their agents to South Africa too, to make purchases of diamonds. They purchased two large yellow diamonds which were eventually cut in New York city, to yield a light yellow cushion of 77 carats and another yellow diamond of 51 carats. 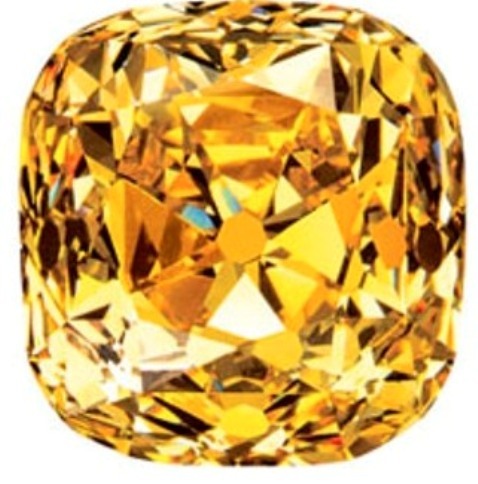 Then in 1878 they purchased the Tiffany yellow which in the rough state was a beautiful, canary yellow, octahedral, crystal weighing 297.42 carats. The Tiffany yellow is believed to have been discovered either in 1877 or 1878. This was a time when no accurate records were kept of the discovery of large diamonds. Even the mine where the diamond was discovered is not exactly known, but believed to be the mines of the French Company, Compagnie Francais de Diamant du Cap, which was one of the Kimberley mines. Being a French company, the rough diamond discovered was dispatched to Paris, where it was shown to the representatives of Tiffany. Later the head of Tiffany's Paris office, Mr Gideon Reid, purchased the diamond for $ 18,000, on behalf of the company in 1878. A team of cutters under the supervision of the company's eminent gemologist George F Kunz, was entrusted the task of cutting the stone. They made an extensive study of the stone, to arrive at the best possible shape and cut for the stone, in order to release it's intrinsic beauty. 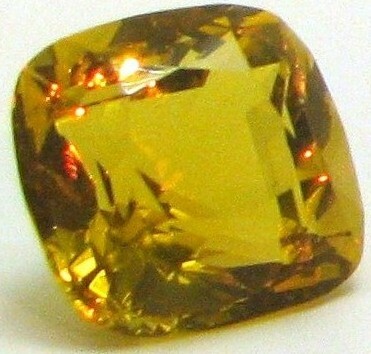 Eventually after an arduous task which took almost an year, the stone was fashioned into the cushion-shaped golden yellow (canary ) brilliant of 128.54 carats. It is the second largest golden yellow (canary yellow) diamond in the world, after the Red Cross diamond which weighs 205 carats. The finished Tiffany yellow diamond was shipped to New York on the "City of Chester"on 15th June 1880. Little publicity was given to the arrival of the Tiffany yellow in New York, but before long it's presence in New York, became widely known. In 1896, The viceroy Li Hung Chang, one of the triumvirate who ruled China arrived in New York. It is said that the President of the United States, President Grant (1869-77) once remarked, "there are three great men in the world, Gladstone, Bismarck and Chang, but the greatest of these is Chang. "During his stay in New York, Chang expressed a wish to see the renowned Tiffany yellow diamond. The request coming from such an august visitor, was considered an honor and privilege by the company and they duly complied with his request . 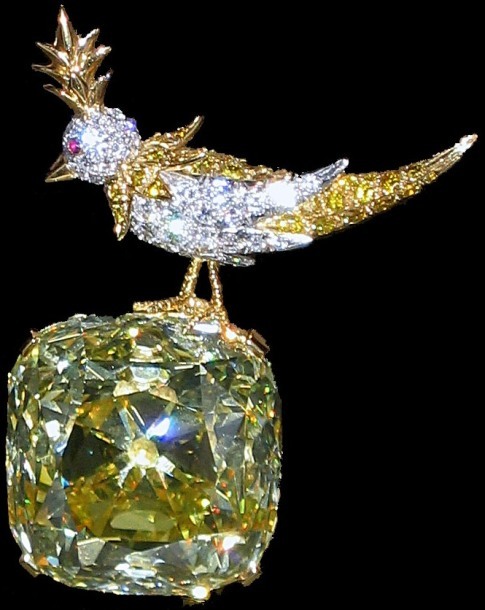 Tiffany Yellow Diamond in "Bird on a Rock"setting. The Tiffany yellow diamond has been on display at the Tiffany store in New York for the last seventy years, and millions of people from the United States and around the world have seen this rare and unique canary yellow diamond. The diamond had also been put on display at several exhibitions in the United States. 1. The Chicago Columbian exhibition in 1893. 2. The Pan American exhibition in 1901. 3. The Chicago century of progress in 1933-34. 4. The New York world fair in 1939. The diamond was also displayed at some exhibitions held outside the United States. 1. The exhibition held in South Africa in 1971 to mark the centennial celebrations of the Kimberley mines. 2. A display at Tiffany's London at Old Bond Street in 1986 to herald the return of the company to London after an absence of 40 years. 3. An exhibition in Paris in the year 2000. The first time the Tiffany was worn as an ornament was in 1957, when at the Tiffany Ball held at Newport, Rhode Island, the chairwoman of the ball Steldon Whitehouse wore the diamond on a special necklace of white diamonds, designed for the occasion. Tiffany designer Jean Schlumberger designed three jewelled settings for the Tiffany diamond in 1956. The current setting also designed by Schlumberger, "bird on a rock"was mounted in 1995. This is Tiffany Yellows' most well known setting, in which it remains to this day. The Tiffany diamond will be on display at the Natural History Museum of the Smithsonian Institution from April 12, 2007 to September 23, 2007. This is the first time the Tiffany diamond has been shown at a U.S. museum outside of New York. The temporary display of the Tiffany diamond celebrates the opening in the Smithsonian gemstone gallery of their new acquisitions case, dedicated to displaying gemstones acquired by a newly established fund, The Tiffany &Co. Foundation Endowment. The Tiffany Yellow had been in the possession of Tiffany &Co. for the past 129 years, and the diamond has become the icon of Tiffany &Co. The history of the diamond during this period is closely associated with the history of the company. During this long period, at least on three occasions, attempts had been made to sell the diamond. The first one was in 1951 when the new Chairman of Tiffany's recommended that the gem be sold, a decision that did not meet with the approval of certain members of the old board. A deal was negotiated for $ 500,000, but failed to materialize because the prospective buyer could not pay the amount in full, and wished for other financial arrangements to be made. Again on November 17th,1972, the New York Times carried an advertisement by Tiffany offering to sell the diamond for $5,000,000, The last time the stone was offered for sale was at the end of 1983, when it was valued at $ 12,000,000. According to the above list the Tiffany Yellow is the 7th largest yellow diamond and the 2nd largest canary yellow diamond in the world. Color in diamonds is caused by the presence of trace amounts of elements like Nitrogen and Boron, which are incorporated into the crystal structure of diamond. Nitrogen and Boron atoms whose atomic sizes are comparable to that of Carbon atoms can replace some of the Carbon atoms in the crystal structure. Diamonds are divided into two types according to the concentration of the trace amounts of Nitrogen in them. If the Nitrogen is in detectable quantities the diamond is Type 1. If Nitrogen is in undetectable quantities the diamond is Type 11. 98% of all naturally occurring diamonds are Type 1, the remaining 2% are type 11. Type 1 diamonds are again divided into two depending on whether the Nitrogen atoms occur as aggregates or scattered as single atoms. If Nitrogen atoms occur as aggregates the diamond is Type 1a ;if they occur as single atoms the diamond is type 1b.The occurrence of Type 1a in nature is almost 98%,and that of Type 1b is 0.1%. Accordingly Type 1a diamonds are again divided into three. Type 1aA- Nitrogen occurs as A-aggregates-Diamonds colorless and non-florescent. Type 1aB- Nitrogen occurs as B-aggregates-Diamonds colorless and strongly florescent. Type 1aAB-Nitrogen occurs as A- aggregates, B-aggregates, and N3-centers-Diamonds vary in color from pale to medium or sometimes intense yellow depending on the concentration of N3-centers. Diamonds also show faint to medium florescence. Type 1b-Nitrogen occurs as scattered single atoms which absorb light in the blue end of the visible spectrum, producing an intense yellow color (canary yellow) and sometimes a brownish tint. They also show various degrees of florescence. Type 1b diamonds are less than 0.1 % of all naturally occurring diamonds. Therefore, the Tiffany yellow diamond which is a canary yellow diamond is an extremely rare Type 1b diamond.